"Inspiration for East of Paris came from my own love of Eastern design and Parisian haute couture, so I set out to fuse these two styles." the Diamond Fairy Crown is the most prized of the East of Paris collection. Large lozenges of openwork feature eight brilliant-cut 1.2-carat diamond droplets interspersed between four smaller regal motifs. round points are four more 1.2-carat baguette-cut briolettes. 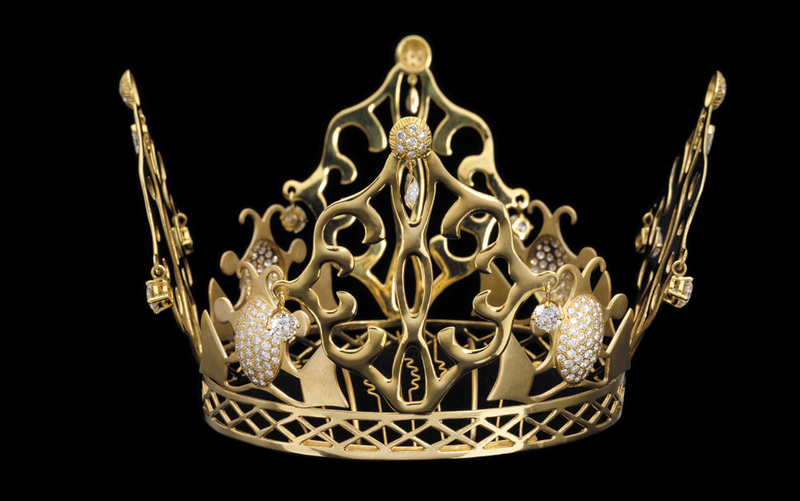 The crown measures 9x9cm, with a gold hair comb fixed at its latticed base to ensure maximum lightness and comfort for its wearer. This exquisite Diamond Fairy Crown has enjoyed much publicity since Victoria Beckham wore it to her wedding to David Beckham in 1999.
and at the Diamond Museum in Antwerp, Belgium (Diamond Divas, 2008).